Search Engine Optimisation (referred to as SEO from here on) is the process of applying different and varying methods in order to obtain a higher ranking on different Search Engines for your chosen keywords. There are a myriad of different things that contribute to the actual rank and the search engines release new algorithms periodically so staying on top of the latest SEO news is of paramount importance in order to maintain your website’s position. SEO techniques vary from the very simple to the obscenely difficult and each technique can be considered either ‘white hat’ or ‘black hat’ depending on whether it is a trustworthy and reputable technique. For example backlink farming is considered a black hat technique and will eventually hinder the progress of your website. For this particular case study we decided to analyse our own website (http://www.asit-group.com) and try to gain first page on Google for a search term for which we were not indexed at all at the time. The search term chosen was “web development coffs harbour”. Please note that this report will hint at the use of various tools however will not actually use any specific names or give any specific websites used, also note that when the term ‘Google’ is used it refers specifically to ‘www.google.com’ and not any redirects based on country. The starting date of this research was the 25th of October 2014 and it finished exactly two months later on the 25th of December 2014. After researching what the latest algorithms demanded of high ranking websites an audit was done of our website. We decided on how we were going to target the website in order to utilise the chosen keywords most effectively. Firstly, the code itself was not compliant with the standards from the W3C and as such would have a negative impact on the ranking. After the code was made to be compliant additional meta tags were added, with better, more precise descriptions, titles and keywords. A viewport was also added in order to help mobile viewing of the website. After auditing our website we discovered that a lot of the content on our website was not well optimised and as such we had to go back and remake images and reword text in order to achieve a better website responsiveness and loading time. 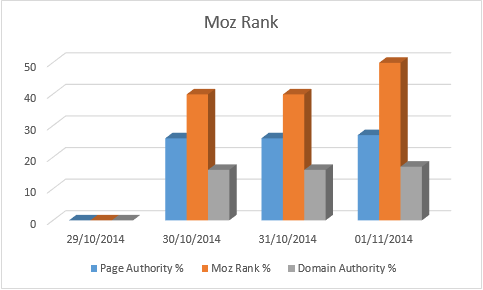 Moz Ranking is a very important system that does weigh in when ranking your website. Moz has the ability to rank your website based specifically on the domain and the trustworthiness as well as give it an overall score. After doing a fair bit of research on the matter it was found that a decent Moz Rank starts at 3 out of a possible 10 so this is what we were aiming for. The Moz Rank was one benchmark used continuously throughout the study in order to compare how the techniques were working. In order to increase the Moz Rank as well as how the Search Engines viewed our website it was extremely important to generate lots of reputable backlinks from trustworthy websites. Various techniques were used for this and within the two months we went from having no backlinks at all to at least 100, the final numbers are uncertain because there are many different tools used to count the number of backlinks and they all had different results. Some of the most trustworthy websites according to the Search Engines are the big social media platforms such as Facebook, Instagram, Twitter, LinkedIn and of course Google itself. As such we doubled our social media efforts and made sure we linked back to our website at every available opportunity. In order for a website to appear as trustworthy it must be seen as an ‘authority’ in the field. One of the easiest and also most effective ways of doing this is by blogging about your selected topic. We continued blogging about various topics as often as possible and actually embedded our blog into our website as well and encouraged people to visit the website to read the blog rather than the blogging platform we were using. 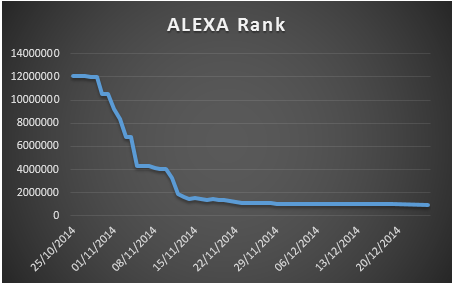 Alexa is another important rank and is basically a global rank. One of the tricky bits about SEO is this, in order to reach a higher place and gain more traffic you first have to have a lot of traffic. It’s a catch 22 situation. As such we tried to drive more and more traffic to the website in order to increase this aspect and gain a better result. What we managed to do was actually quite impressive. Google PageRank isn’t actually updated as frequently as it should be and as such isn’t a reliable tool for SEO, for the primary part of this research it was ignored. Obviously there are a lot more techniques involved in this process with a lot of different tools being tried and tested and we actually also built a couple in house to help with the process. The Moz Rank results jumped very quickly in the first few days after the optimisation was applied and remained steady for the duration of the research. Each measure was converted to a percentage for the graph to provide a stable comparison. This is the area where we saw the most immediate improvement. The first graph displays the actual position (the lower the number, the better). Our initial rank was above 15 million and our final rank after the 2 months was about 966 000. 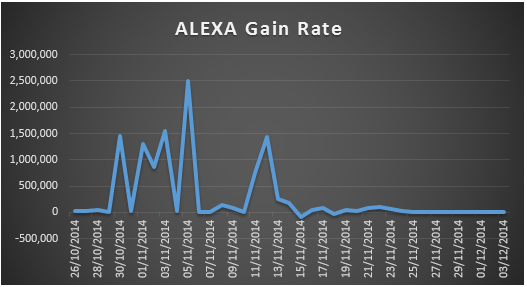 This next graph shows the varying rates at which we gained places on the Alexa Rank and shows how the rate lessened towards the higher ranks as there was a lot more competition. 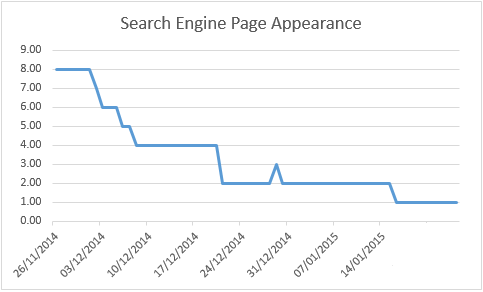 It also shows how, at one point we actually lost places on the Alexa rank. Finally the most important result, where our website actually appeared in Google when searching for the term chosen. Initially, the website was not anywhere in the first 30 pages (possibly more, it wasn’t checked). Within a day we had jumped to page 8. The ranking remained about the same for a period of time until it jumped and then jumped again. The end result is obvious that we did in fact manage to get on to the first page of Google for the search term chosen. We are currently swapping between positions 6, 7 and 8.